Chelsea returned to Westminster in 2015 to work in the Reeves Library while completing her Master’s in Library and Information Studies at the University of Missouri. Her family is deeply connected to Westminster. Her mother, Dr. Maureen Tuthill, is chair of the English department, and Chelsea’s siblings, Veronica ’16 and Steven ’18, followed in her footsteps as Westminster students. Chelsea has loved her time as a Westminster student and staff member, and she is reflecting fondly on her time here as she prepares to move to Massachusetts to accept a reference librarian position at Springfield College. What drew you back to Westminster after graduating in 2012? 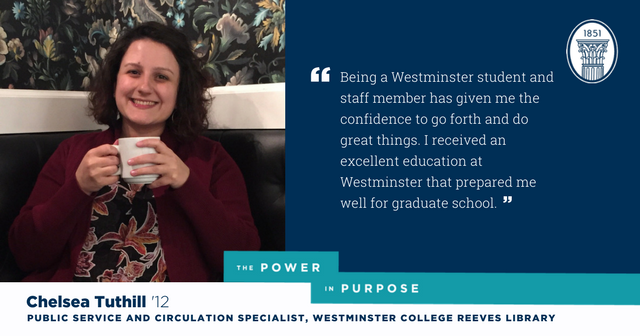 I saw working at Westminster as an opportunity to connect with current students while also implementing what I was learning in my coursework at MU. It was one thing to learn about how to do a reference interview in a textbook, but it took on a whole new meaning when I was helping Westminster students with research for classes, some of which I had taken back when I was a student here. Does Westminster hold special significance for you because of your family connection? When I first started as a student at Westminster, no one knew yet about my connection to the English department. I actually got to take a class with my mom in that first semester (I can also boast that I am the only one of my siblings to do that)! It’s been wonderful to be able to see my mom and my siblings around campus every day and is definitely something that I will miss when I move to Massachusetts. It’s also been nice to have a companion in my mom for big campus meetings and events. I never have to worry about who I should sit next to! How did Westminster help you choose a career in library science? Being an English major, I always knew that I wanted to do something that involved education and literature. It took me a couple of years to figure this out, but Westminster played a significant role. By being part of the Westminster community, we truly are part of a global community. Shortly after I graduated from Westminster I traveled to Kosovo where I unexpectedly found myself teaching English. I wouldn’t have had that chance if it hadn’t been for people I met at Westminster. As I was teaching in Kosovo I realized that I liked helping my students one-on-one more than I enjoyed being in front of the classroom, so that’s when the gears really began to turn for applying for graduate school for Library and Information Studies to become a librarian. Which professors had a particular impact on you? Obviously my mom, but also the entire English department, especially Dr. Dave Collins, Professor Wayne Zade, Dr. Deb Brenegan, Dr. Theresa Adams, and Dr. Heidi LaVine. I loved every single class I took in the department. Heidi LaVine gets a special mention, though, for advising my senior honor’s thesis. I found my research binder and a copy of my thesis the other day when I was packing and it reminded me of all the blood, sweat, and tears (literally, lots of tears) that went into my thesis. Dr. LaVine was there for every step of the way to share her insight and expertise, but also to be my biggest support when it came to writing and researching. Other professors who made an impact on me were Dr. Butch Lael and Dr. Cliff Cain. I think about classes I took with them all the time. I also had the opportunity to take an amazing travel course with Dr. Alan Goldin in 2011, which eventually led to me being the maid of honor for fellow Westminster alumna, Camille Stiegler Burgmeier ’13, though I obviously didn’t know that at the time. What are some of the highlights/your favorite memories of working at Reeves? I was happy for the opportunity to aid in the library renovation after the flood and fire in 2016. I’ve also enjoyed putting together programming for students like the Therapy Dogs during finals week in May and the recent Bookish Halloween Costume Contest. What are you looking forward to in moving to a new job in Massachusetts? The library that I am moving to has just undergone a major renovation, so I am excited to be joining their staff to help them “break in” the new building. I am also happy for the chance to be able to work with students in their graduate programs. My family is from the East Coast, so this will be like returning home in many ways. I am looking forward to being close to members of my extended family and being a train ride away from Boston and New York City! What values or skills will you take with you from your time at Westminster? Being a Westminster student and staff member has given me the confidence to go forth and do great things. I received an excellent education at Westminster that prepared me well for graduate school. As cheesy as it may sound, I think Westminster truly prepared me for the real world after I graduated and has now prepared me for the next step in my career as an academic librarian. Learn more about majoring in English at Westminster here.